In 2005 I made a poncho from this fabric and it turned out to be extremely warm and cuddly. 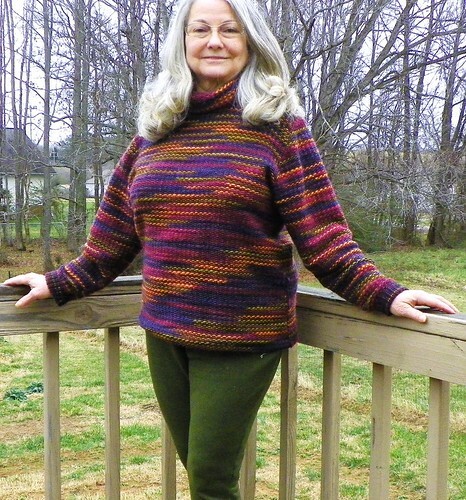 I reviewed how to make a poncho here It is knitted wool with an acrylic fancy slub yarn running through it. In machine knitting we call this a Knit Weave. (The exposures below has been messed with in order to make it a bit easier to see the fabric) I LOVE fabric, have I ever said that before? The seams were closed with 4 thread serge and a 3 thread cover stitch secures the sleeves and hem. This pattern has been around for a long time. If cut to my real size it would have slightly dropped shoulders and slight waistline shaping. 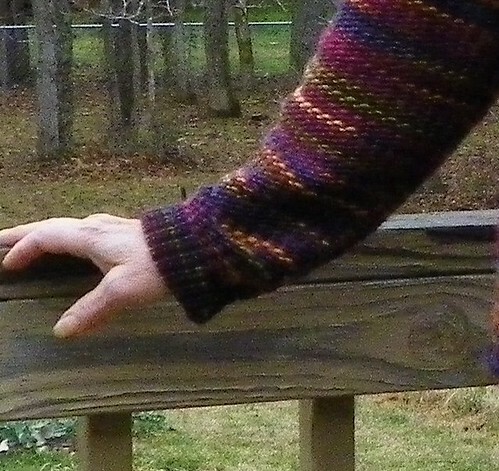 I made view A and view B provides for ribbing at the collar and cuffs. Oh my! I love the hair. I had no idea your hair was long and good for you for leaving natural, which i much prefer. The sweater is excellent too. 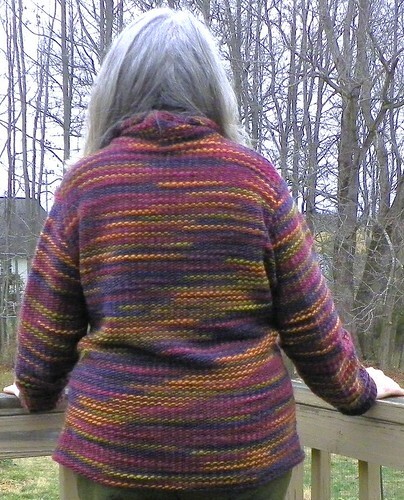 I have never made anything in knit weave other than swatches. I think I have had trouble getting a less than stiff drape. Super sweater. Oh, that hair! Love the hair. I love the sweater knit! The color mix is fabulous. It’s definately great for a dreary winter day! I so wish I had the guts to divorce my hairdresser. You wear the grey well but on me I think it would age me too much. I’m only 54. Maybe in 10 years! That’ what I said at your age, Debbie. But I went gray at 60 and I wouldn’t go any other way now! First thing I saw was your hair!!! LOVE IT! It is gorgeous. AND, I am done done done….my course/training of course, so now I am job hunting or will be in a little while. For now I am taking a break to breathe. That’s great news, Heather. Good job hunting to you and Merry Christmas!